You could tell he is a Muslim when his lips moved. Now let’s check old Jeh, Holder, Hillary, Schemer, etc., or they could just be plain-old American traitors, with no religion whatsoever. Furthermore, as UTT has repeatedly reminded, and the Turkish President Recep Erdogan, who aspires to become the next global Caliph, has angrily confirmed, “Islam is Islam”, there has thus never been, is not now, and can never be any sort of gradual passing from one contextual shade of Islam to another. 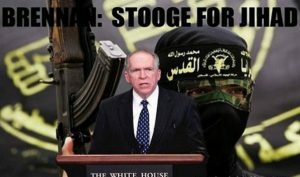 Thus the moment John Owen Brennan concluded his voluntary recitation in Cairo of his statement of faith (shahada), whether he likes it or not, he became slaved evermore to a draconian quintet of 7th century sharia-adherent supremacy in the role of a jihadist from which he can never escape. So Bon Voyage, you treasonous nitwit! Though notwithstanding any of that, there remains one much more important and unsettled lingering question since John Owen Brennan’s ostensible retreat from the public arena into the shadows, I.e. as to whom he has surreptitiously relinquished control of his Orwellian creation known on its Wikipedia page as a “Disposition Matrix” aka “kill list” [which by all means every American still able to read English should quickly explore]. For should future command & control of John Owen Brennan’s license to kill anybody, anywhere on the planet without probable cause, sans retribution, and without regard for what the military-industrial-congressional complex refers to as “collateral damage”, and most others call children, ever ends up in the hands of his Muslim Brotherhood terrorist allies – who thanks to Robert Mueller the 3rd’s cover-up gutting of his bureau’s ability to enforce federal law threaded to urgent FBI Special Agent’s pre and post 9/11 terrorist concerns (I.e.,by denying their critical-warrant and U.S. Attorney contact requests) and as if that weren’t enough criminal malfeasance, by also ordering at the behest of John Owen Brennan the purge of any FBI operational & training data containing references to Islam — were able to make RICO-like swaps of Middle-east millions of illegal (foreign) GOP political donations in exchange for numerous high-level decision making positions in the U.S. government related not only to national security, law-enforcement and intelligence entities, but to White House access as well, the existential war Islam declared on our country by virtue of the 11 September 2001 sharia-adherent terrorist attacks involving the murders of 2996 mainly American victims will at best become much harder to win, with one caveat, I.e. reconvene the 9/11 Commission for the express purpose for once of actually seeking the truth from the elitist immune among us, gaining convictions, and sending the relevant guilty to prison where they belong. To better understand how sharia-adherent Muslims plan to take over the country and either enslave or kill you send for a nominally priced copy of the actual evidence document seized by the FBI from a subterranean basement in Annandale, Virginia which was used by a U.S. District Court in Texas to clarify beyond any reasonable doubt why they’re here and the level of unbridled hate they harbor for any non-Muslim i.e.– info@securefreedom.org.